Canadian Joni Mitchell is more than just another singer-songwriter: she was one of the most brave and pioneering female artists of the 20th century. Fiercely independent of outside pressures, she had no hesitation in taking artistic risks even when commercial success was at stake. Mostly, her risks paid off, as her relentless creativity kept fans loyal and won fulsome praise from music journalists. "In the original, where Mitchell’s voice often disappears in the mix, she’s now out front and center, with a creaminess that I’ve never experienced before. There’s just more space everywhere; more bass weight and a huge soundstage in all three dimensions. All of the harshness in the original is gone. The additional space in the recording now lets you really hear the genius in the arrangements; if you thought you knew this record before, you are in for a number of sonic treats upon listening to the ORG pressing." ORG did it right, even at 45 rpm, the grooves only go half way into the vinyl surface, so there will be no worries of inner groove distortion on this record! ...So, if this is one of your favorite Joni records, you owe it to yourself to purchase this one, it’s pure sonic perfection." After developing a reputation around New York as a folk singer to watch, she made an international breakthrough with the 1970 single "Big Yellow Taxi", which featured the famous lyric "They paved paradise and put up a parking lot". 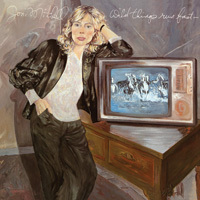 Wild Things Run Fast is Joni Mitchell's eleventh studio and her first for Geffen Records. Released in 1982, it represents her departure from jazz to a more '80s pop sound. The more rhythmic nature of the music on this album was influenced by Steely Dan, Talking Heads and The Police. Featured artists include Wayne Shorter, James Taylor and Lionel Richie.